Increasing danger and the revealing of clairvoyant abilities ramp up the suspense and intrigue. 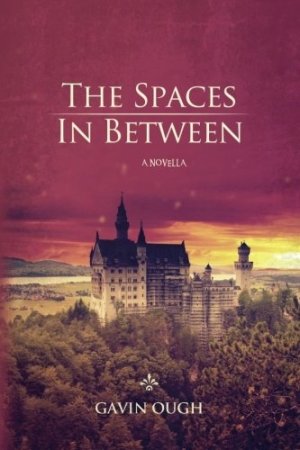 A young man forced into dangerous service to his kingdom ultimately finds his path in Gavin Ough’s brief but jam-packed fantasy adventure, The Spaces In Between. Gremlaw is born into a modest, loving family, but the tranquility of his early life is irretrievably shattered by the sudden death of his father. With his grief-stricken mother too inconsolable to care for him properly, Gremlaw takes matters into his own hands, a decision that sets off a course of events that promises to change him forever. Gremlaw meets a young orphaned girl named Huleta, whose brazen thievery inspires him. Through Huleta, he discovers the concept of “negative space,” and his own ability to take advantage of it. His talent soon draws the attention of the Duke DeLarouge, who forces Gremlaw to use his gift in service to the kingdom of Trathlain. With his loved ones threatened, the rebellious and reluctant Gremlaw agrees to help discover how a dangerous drug named Forever is being distributed throughout the kingdom, and how the neighboring kingdom of Lavash is involved. The Spaces In Between packs a good deal of action into its scant 152 pages, and readers who enjoy a quick, fast-paced read will not be disappointed. Gremlaw’s adventures become increasingly dangerous as he gets closer to the truth of his mission and as his own powers become more apparent. His ability to slip quickly through spaces others overlook is an unusual talent that some seek to exploit. These fantasy aspects, which include unique mind-reading abilities, are intriguing. Characterization is generally well done, particularly in respect to the main protagonist. Gremlaw’s progression from a young marketplace thief to champion of his kingdom is credible, and his evolution is natural. Supporting characters are mostly well rounded and effective. Gremlaw’s interactions with the family of a man who is being used similarly by the Duke show his growth into a selfless young man who will risk it all to do the right thing. Ough has based his novella on a twenty-part endeavor on Serealities.com, an online collection of serial stories. While an interesting origin, such a process can result in a slight disjointedness, which is apparent in some parts of the story. For instance, when Gremlaw discovers that his mother is being held by the Duke’s followers, he confronts one of them; when the woman hands him a bottle of what she claims is an antidote for “The poison that even now courses through your mother’s veins,” he inexplicably hands the bottle back to her and leaves without giving the antidote to his mother, instead merely issuing a threatening warning about mistreating her. Such discrepancies are rare, however, and can be easily addressed with another round of editing. Gremlaw’s journeys are compelling and imaginative, and the author leaves the door open for further adventures. Appreciative readers will look forward to learning even more about Gremlaw and his unique abilities in Ough’s future writings.